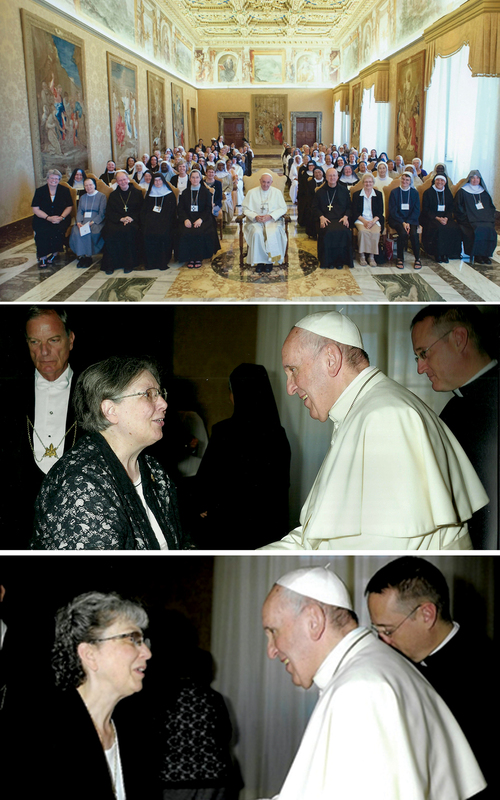 Sisters Jeanne Weber and Patricia Ann Toscano recently attended the International Communion of Benedictines Conference in Rome (top photo). After the conference, the sisters spent a few days at Maria Rickenbach and Marienheim Monasteries in Switzerland. The sisters also were part of a private audience with Pope Francis with Sister Patricia in the middle photo greeting Pope Francis and Sister Jeanne in the bottom photo greeting Pope Francis. The sisters helped plan the liturgical celebrations for the conference. (Photos courtesy, Sacred Heart Monastery, Yankton).